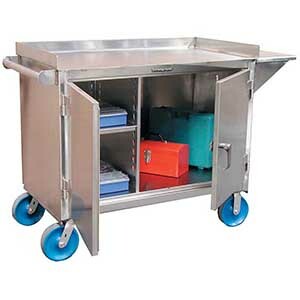 Stainless Steel Mobile Cabinet - 46" x 26" x 41"
Safely store items that need to be locked away, in a mobile stainless steel cabinet constructed from 12 gauge stainless steel with a 7 gauge stainless top work surface. The top has three raised edges and a flush front edge and the ends of the cart have a push bar for added worker comfort and the other is set-up with a vise shelf. The lower portion is a cabinet with doors that lock with a padlock and utilize a three point locking system for added security. One side of the cabinet has (1) adjustable shelf and the other end is left open for storage of larger items. The cabinet sits on (4) 8" x 2" swivel polyurethane casters with brakes. WARNING: This product can expose you to chemicals including Nickel and Wood Dust which are known to the State of California to cause cancer. For more information – www.p65warnings.ca.gov.